Chicago police have described the video as a "sickening" possible hate crime. The assault went on for two days, until the man was found disorientated, walking the streets. 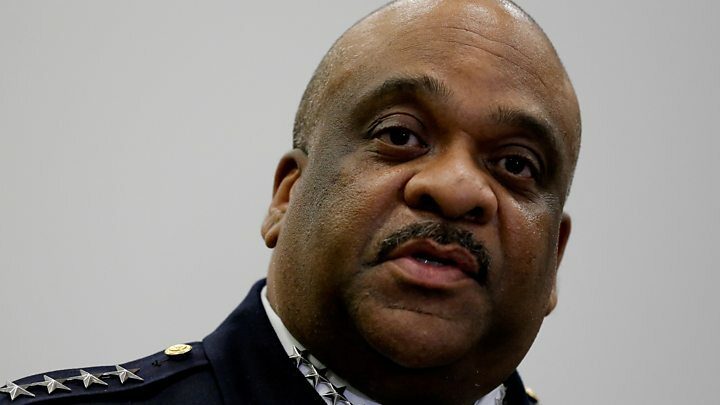 "It makes you wonder what would make individuals treat somebody like that," said Chicago Police Superintendent Eddie Johnson. Media captionSupt Eddie Johnson: "What would make individuals treat somebody like that?" "I've been a cop for 28 years, and I've seen things that you shouldn't see in a lifetime, but it still amazes me how you still see things that you just shouldn't." What did the video show? The incident happened in a flat on Chicago's West Side. In the 30-minute video, the attackers can be seen cutting the 18-year-old victim's clothes, dropping cigarette ash on him, pushing his head back with a foot and drawing blood by cutting off some of his hair with a knife. Several people can be seen drinking, laughing and smoking, while their bound and gagged captive cowered in the corner of the room. In other videos posted online the young man is beaten, made to drink from a toilet bowl and forced at knife-point to say "I love black people". An African-American woman talks to the camera, sometimes with slurred speech. At least two male African-Americans are also visible in the footage. How did police find them? The unnamed white victim is a school acquaintance of one of the attackers. Police say they found him on Monday wandering in the streets in a disorientated and distressed state after the assault. Later they say they responded to reports of an assault close to where he was discovered and uncovered evidence of violence and damage to property. They described him as facing "mental health challenges". They believe he may have been kidnapped for up to 48 hours prior to the assault. He was taken to hospital, traumatised by the attack, and had difficulty communicating with police, but was later released from hospital. Who has been arrested and have they been charged? Police say four people, two male and two female, aged 18, have been arrested. Three were Chicago residents, they said. On Thursday, a police spokesman said the four black suspects made "terrible racist statements" during the assault. But he said police think the victim was attacked because he has "special needs", not because he is white. Police also said there was a possibility that the incident would be considered a kidnapping. BBC North America correspondent James Cook says the incident is shocking, but gangland violence is far from uncommon in Chicago. It recorded 762 murders last year, more than in the larger cities of New York and Los Angeles combined. In speeches and tweets, President-elect Donald Trump has made much of the crime and racial division in the city where President Barack Obama worked as an activist and a senator. The incoming president now faces the much tougher challenge of turning damning words into useful actions. The incident has provoked a strong reaction on Twitter, especially among alt-right - the fringe group that celebrated Mr Trump's election win with Nazi salutes. They say the mainstream media has been slower to react, and the police slower to label it a hate crime, than if a black person had been assaulted by white people. The hashtag #BLMKidnapping was adopted by users suggesting the Black Lives Matter campaign was in some way involved, although police have not mentioned the organisation in connection with the incident. Some people, however, used the hashtag to dismiss the suggestion as completely unfounded. It was trending worldwide and in the US, with more than 280,000 posts in 12 hours. The video was streamed on Facebook Live for 30 minutes, but the company later removed it. A spokesman told Associated Press the social media giant does "not allow people to celebrate or glorify crimes on Facebook". Some versions of the video have also been removed from YouTube, after users reposted it. Facebook detailed its policy on live-streaming in July 2016, after the filming of the aftermath of an incident in which a police officer shot a black man dead in St Paul, Minnesota. The company says its rules for live video are the same as for other content. Footage will not be removed simply because it is violent or graphic, but if it is shared to mock the victim or celebrate the violence it will be taken down. Live videos can be reported to a team which is on call 24 hours a day. Reviewers in the team can interrupt a live stream if it breaches Facebook's community standards. In June, Chicago man Antonio Perkins, 28, was shot dead while live-streaming a video of himself on Facebook. Can big data help us predict crime?